Catherine Colsher's personal visions are expressed through her finely detailed hand colored copperplate etchings and original paintings. Her work has received numerous awards and recognition, and they are appreciated for their intricate and complex detail. Though never formally educated in art, her career direction was evident as early as childhood. Born and raised in Philadelphia, Catherine always had a passion for the fine arts but began her career as a graphic artist in advertising. This career path evolved in 1988 when she chose to direct her creative energy into fine art. While she explores a variety of subject matter, she is particularly drawn to the serenity and elegance of nature and its many moods. Colsher enjoys the technical challenge of the 15th century technique of etching. The artist explains: "Etching allows me to become very detailed in my work through the purity of many drawn lines or shading. Every step in the etching process is a challenge for an artist because each one presents opportunities for creative possibilities. However, the success of an etching cannot be fully determined until the final stages have been completed. So patience plays an important part in its creation, but I find the entire process very intriguing. Catherine also expresses herself with the more immediate and inspiring process of painting. She enjoys the two very diverse mediums of etching and painting because they are so different. Unlike etching, a painting begins to take shape the minute the artist applies paint with her brush and it also allows for a greater expression of color. Oils, watercolors and acrylics are the vehicles Colsher chooses to express her visions. Each type of paint presents its own challenges and reveals different results, therefore, the type of paint she chooses for a particular work depends upon the subject of her painting and the mood or effect she wants to convey. 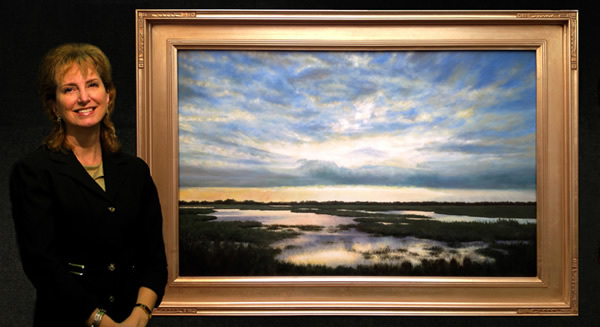 Catherine's work has been exhibited in numerous galleries throughout the United States and abroad, select juried exhibitions and has been acquired for many private and corporate collections.